Have you noticed all the candy in your grocery store? Actually, candy seems to be in every store. Clearly, Halloween is around the corner, which means there will be lots of snack size goodies available to eat. 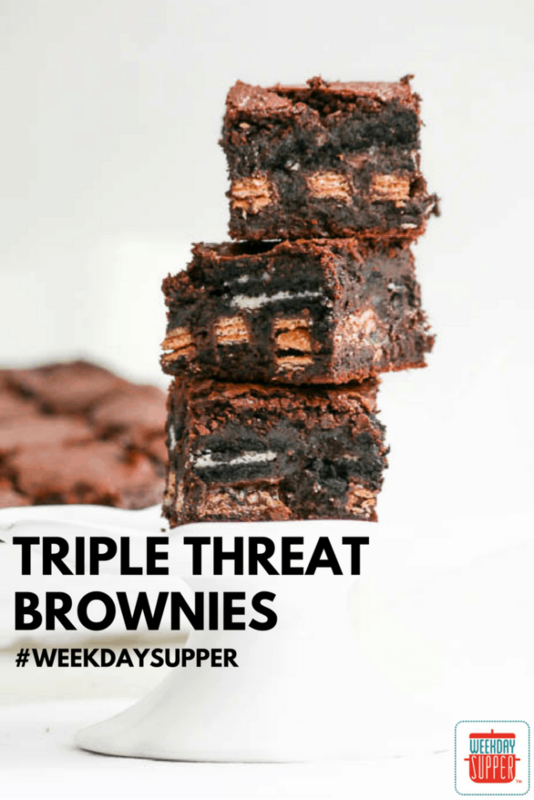 Yet, why simply eat candy when you can use it to make Triple Threat Brownies? I did a quick trip to a store with my 10-year-old the other day and sure enough, there was a buy two snack-size bags/get one free promotion going on. I spotted darkness Kit Kat bars and swooned a bit. And last week I took advantage of a buy one/get one promotion for family size Oreo cookies! Well, how could I ignore the Oreos while paying attention to the Kit Kats? The first thing that I did was line Kit Kat bars into the pan, still in the wrapping. I find this to be the easiest way of knowing how many bars I will need in a recipe as well as being able to get a visual of what I will need to do once the candy bars are out of the wrapper. It makes a lot more sense to move them around if they are not sitting in chocolate batter. The Oreos are broken into quarters, although it’s fine if they are not all the same size. Then it’s just a matter of layering the Triple Threat Brownies. 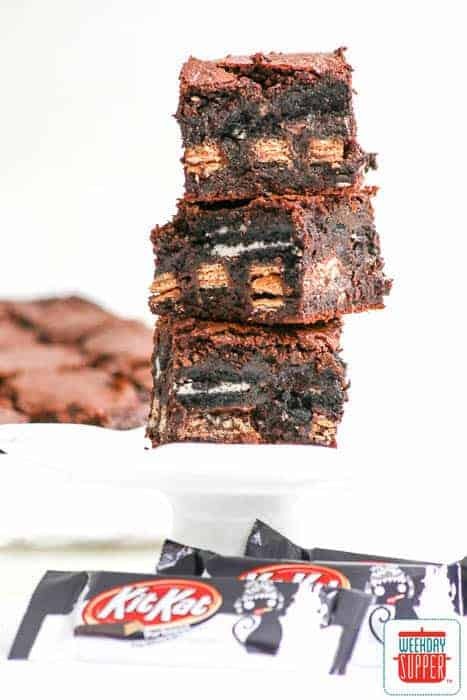 A small offset metal spatula is the perfect tool to help spread the brownie batter on the bottom of the pan (or parchment paper, if you line your pan), as well as cover the Kit Kat bars and then cover the Oreo pieces. If you are one who likes a “trick” for Halloween, be sure to have people guess what’s inside. There’s a good chance nobody will guess this combination unless they see it. As for those looking for a treat, look no further. 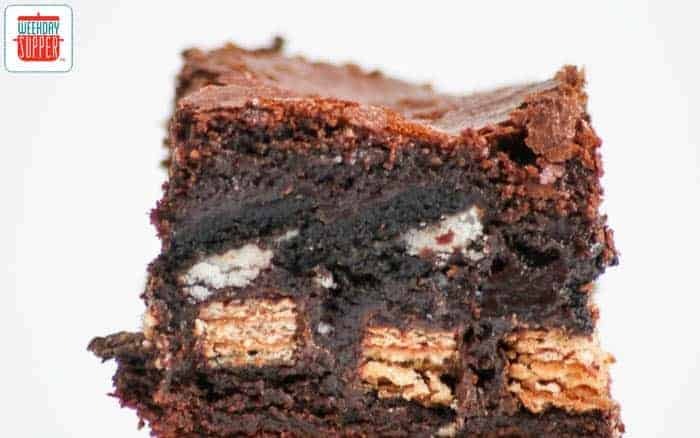 Triple Threat Brownies are a treat you will want to enjoy well past the candy season. Line a 9" x 13" or 33 x 22 cm baking pan with parchment paper and set aside. Add half of the dry ingredients followed by the melted chocolate/butter and vanilla. Blend in the remaining dry ingredients. Transfer a third of the batter to the parchment-lined baking pan and use an offset metal spatula to spread it in the pan. Evenly place the Kit Kat bars over the batter. There will be six bars going down and four bars going across. Cover the Kit Kat bars with a third of the batter, using the offset spatula to guide the batter. Place the Oreo cookies on the batter. Spoon the remaining batter over the cookies and use the offset spatula to gently spread the batter over them. Bake in your preheated oven for 35 minutes. Remove from the oven and cool completely before cutting into bars. 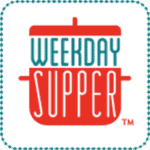 If you like this special Weekday Supper treat, you are going to love our Sunday Supper theme this week – recipes using leftover Halloween candy! Make sure to check back tomorrow to see our preview post with the fabulous list of what we’ll be sharing. And don’t forget to sign up for our newsletter to get great recipes delivered right to your inbox every Thursday! Betsy Cohen brings sweetness to life with her blog Desserts Required and her new eggless, no bake cookie dough balls, available online from Happylicious by Betsy. She has been a Sunday Supper Movement tastemaker for many years. I had so much fun making this recipe. 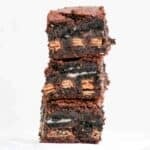 Thank you, Sunday Supper Movement, for putting Triple Threat Brownies in YOUR cookie jar!